I CAN read and continue to learn. Here are three books that I CAN read to help me along the way. hence, creating a customized program that CAN work for me. The first book was recommended by "Little Bug", the Health Educator. The second book was recommended by "Precious", our daughter in Louisiana. by the authors of this book, and implemented their 30 day plan and felt awesome. upon hearing my complaints about "this phase" of life. Tonight will be a challenge as we are meeting friends for dinner and a holiday parade. I have checked the dinner menu at the restaurant and I have a plan: the steak salad sounds really good. Goals are set at 5 lbs loss the first week and 1.5 lbs per subsequent week. Weigh-ins are daily for one week and then weekly until goal is reached. Adjustments along the way may be needed, as I suspect that 120 may be too low for me. I won't know until I get close, so until then I will follow the doctor's advise and forge on. I CAN eat until 6:30 PM everyday. Whatever tempts me after 6:30 PM, I tell myself I CAN eat it in the morning. I rarely feel like it in the morning. Then after 6:30 PM I CAN relax and crochet until the wee hours of the morning. during the evenings, as an me alternative to eating and thinking about food after 6:30 PM. The first Thanksgiving with a loss....ever! I can't believe it - thank you reader friends, you really help. What do you do for fun and relaxation in the evenings? I CAN plan and prepare a healthy meal for guests on the biggest food day of the year. Acorn Squash soup with smoked paprika infused turkey. Turkey is substituted for chicken from this recipe. clementines, strawberries and mint from this post. And I'm trying this recipe for the macaroons. Brussels Sprouts will be provided by #6 Little Bug. She has a recipe that she loves and I can't wait! We have a small group of five, this year. *Every effort has been made to use as many whole unprocessed foods as possible. A fresh organic free-range turkey and homemade ice cream made with cream from grass fed non-injected cows roaming freely would have been nice and preferred; however, this is the year of the "resigned from my job budget" and the final exam for my accounting class deadline was yesterday. I have adjusted based on budget and time. It is in the forefront of my mind; however, to figure out how to pull off the *above type of food plan on a budget, as I believe the money spent will offset health care costs in the future. More posts to come regarding this subject; it's a tricky one. The below chart will be updated with each weigh-in. Please note, I have allowed for a stable weight over Thanksgiving versus a loss. Happy Thanksgiving to those of you who celebrate this holiday! I am grateful for all my reader friends! I CAN walk a 5K in less than an hour 5 days per week. I CAN walk more than that if I want. Nearly two years ago I purchased running shoes, they were $109 and they were awesome. They are worn out and I'm walking now instead of running. Yup, that's what I like. I CAN listen to the "Mockingjay" by Suzanne Collins as long as I am walking. This listening rule while walking has been one of my best fitness motivators. It was a really good motivator, as well. I wonder if it would work for walking? was willing to celebrate my birthday with me by going for a walk together. I wish you were all here and we could walk together too! Goals are set a 5 lbs loss the first week and 1.5 lbs per subsequent week. See you tomorrow for the biggest food day of the year here in the USA! I CAN fill this 32 oz mug up twice and drink it in one day, everyday. (Mug cover from this post). We are hosting this year, but we CAN provide a healthy meal for our guests. Goals are set at 5 lbs the first week and 1.5 lbs per subsequent week. Adjustments along the way may be needed as I suspect that 120 may be too low for me. Thank you all so much for your wonderful comments and support. I have replied to all of you unless you are a no-reply commenter. Please know that all comments mean so much whether I can reply via email or not! commitment to a healthy lifestyle and to blog about it. A New Year's resolution of sorts. I want to share my new plan with you. It's the "Cando" plan because the emphasize will be on what I "can" do instead of "can't". my first goal for this plan is to get into a healthy weight range. This was my weight this morning. at my doctor's office, I do not fall into this range. I'm 5'4"...that's means my healthy weight is 108-132 with a goal of 120!!! It was a rude (SO rude) awakening, as you can see from my weight this morning I do not fall into this "range"
...but I believe it is something I "can" do. So as part of this plan I will make lots of little changes and post about them. I will post my weight for the first (next) 7 days of my new lifestyle. We all know it goes fast that first week with all that water loss and enthusiasm and all. After the first week, I will post my weight every Monday. I understand that the scale is not a good indication of health, but for a numbers gal like me it works. I will continue to post about those next week. I've got a great crocheted chevron infinity scarf coming up! This first week, however, will be all about this plan. After this first week, Monday weigh-ins will continue until I reach my goal weight. Once I meet my goal, a monthly weigh-in, as "they" say maintenance is the most difficult part. Would you like to make your own poinsettia heart wreath? complete with videos can be purchased at Etsy here. I ordered mine from Amazon here. It should/could l look like this. this gives the wreath a lot of flexibility to change and even change with the seasons! I found straight pins with yellow heads for the poinsettias and a red one for the bow. The lighting is not good in this photo; however, I hung mine in the middle of a boxwood wreath above some little wood stabburs on our book shelf. The magical third word I was looking for was "heart". I'm still thinking wreath with poinsettia, bow and holly decoration but the white crochet from yesterday's post has me stumped. Maybe it's a Christmas cover for something with the aforesaid decoration. The 'wreath ring' now doesn't look round, maybe it's a heart shaped wreath. Oh my. I'll have another go tomorrow. 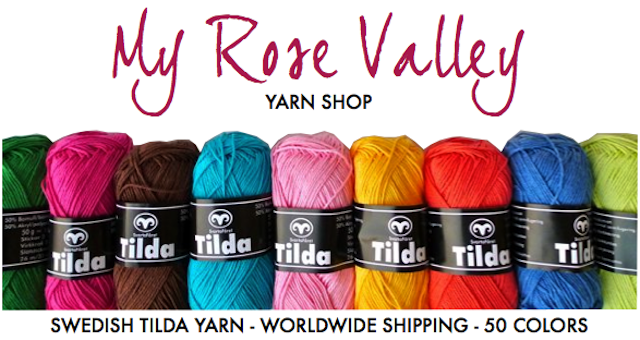 - You can also take the chance to purchase up to 5 more balls of Tilda yarn (4.90 USD/ball) of your choice and add to your parcel with no extra shipping fee. (Thank you so much Annette!) Click here to see all the fabulous colors. 2) The .pdf pattern to make her own project from the guessing posts. I would also like to extend the offer of a free .pdf pattern for the poinsettia to anyone who wrote "Poinsettia Wreath", in the comment section, as this was very close, the only word that was missing was "heart" or guessed "Poinsettia Heart Wreath" after Mum guessed. Please email me at digger.lizzie@gmail.com and I will reply with the .pdf attachment. how to make your own heart wreath! In the mean time, the "Poinsettia Crocheted in-the-round" pattern complete with a photo tutorial and videos can be found on Etsy here. It's "Day Four" of the holiday themed guessing game. The guessing closes tomorrow, Friday 11/22/13 at midnight. With the reveal on Saturday morning. Good luck and stay tuned for the reveal tomorrow!